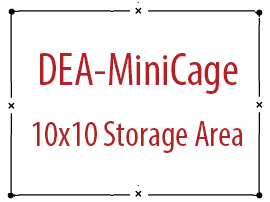 Get pricing on a single (one wall) wall partition to create a DEA Approved drug storage area or secure cage area. Standard or custom height and lengths to meet the unique requirements of your facility. 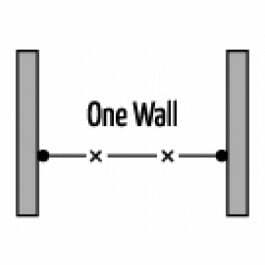 We can help configure a one wall partition for your building today! Contact us for special pricing and consultation. Hinged shall be constructed of the same materials as the panels with two 1/4" x 3/4" horizontal stiffeners across the width, and two diagonal 1/4" x 3/4" stiffeners from center to the corner. Hinged doors shall be equipped with padlock lugs (cylinder lock optional), three 4" x 4" spun pin hinges, and pick plate/slam bar assembly. Doors are self-closing and self-locking. Sliding shall be constructed of the same materials as the panels with two 1/4" x 3/4" horizontal stiffeners across the width, and two vertical 1/4" x 3/4" stiffeners from center to top or bottom. Sliding doors shall be equipped with two 4 wheel trolley trucks, 1 7/8"x 2 3/8" door track, pad lock lugs (cylinder lock optional), and door keeper assembly. Doors are self-closing and self-locking. Non-plated parts receive one coat of gray acrylic enamel. Touch up paint included with each shipment. Special / custom finishes available including powder coated & custom colors. Self closing, self locking doors. Wall and ceiling panels constructed of 10 gauge wire. Posts have welded on base plates for lagging to the floor. Standard mesh has 2" x 1" rectangular opening. Partition Panels mount flush to floor. Heavy 3/8" hardware non-accessible from the exterior. Panels stack to any height to work with your facility or floor plan layout. Clear spanned ceilings up to 35' across. 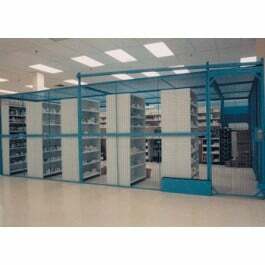 Single Wall partition to create a secure storage area for controlled substances. Available in standard or custom height and lengths. DEA approved to meet physical security requirements of storage areas.